The project eSMCs: Extending SensoriMotor Contingencies to Cognition (1/2011-12/2014, EU FP7-ICT-2009-6 no: 270212) has recently come to an end. You can find more information on the project website. Here I include the reports delivered by our research team. They summarize what was work-in-progress at the time of writing, most of which was later published. But also some bits that have not yet been published. Barandiaran, X., Buhrmann, T. and Di Paolo, E. (2012). Deliverable D1.1: Interim report on eSMCs and embodiment. Barandiaran, X., Beaton, M., Buhrmann, T. and Di Paolo, E. (2013). Deliverable D1.2: eSMCs and embodied cognition. Beaton, M., Barandiaran, X., Buhrmann, T. and Di Paolo, E. (2014). Deliverable D1.5: Cognitive organisation for sustaining eSMCs. Buhrmann, T., Di Paolo, E., Barandiaran, X., De Jaegher, H. (2015). Deliverable D1.6: Agency and eSMCs. Beaton, M. and Di Paolo, E. (2015). Deliverable D1.7 Virtual Actions and eSMCs. Close your eyes and follow the contour of the table in front of you. When you reach the end of it, do you think you would be able to continue moving your hand along the same imaginary line as if the table went on a little further? Most people would not have any problem doing this for a wide variety of conditions (body posture, distance and angle with respect to the table, etc.) Given this variety of circumstances, traditional approaches to perception and motor control postulate when we’re no longer in contact with the table, we must be using some form of representation that keeps guiding the arm along the same invisible line in a robust manner. 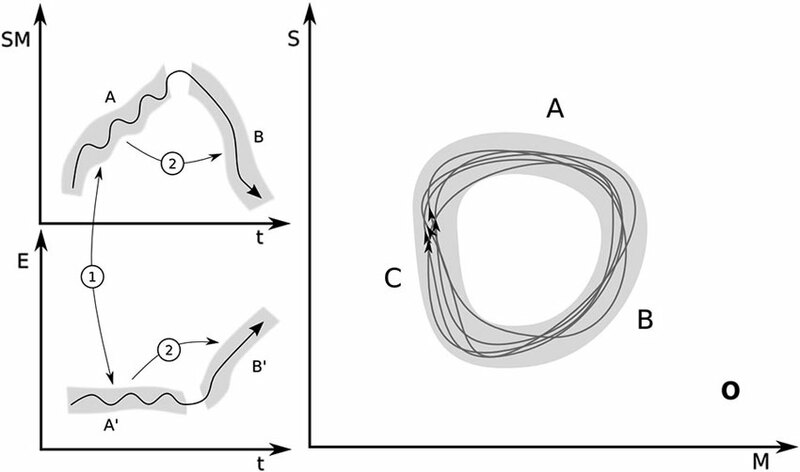 Together with Thomas Buhrmann, we have demonstrated that representations are not necessarily the only explanation, and that indeed it is possible to attune the movement of your arm to the world without at any point involving any internal models or representations, but simply by a shaping of dynamical sensorimotor transients. The “memory” of the direction of movement is kept in the whole agent-environment system in a way that generalizes across various relative positions and angles of movement. Buhrmann, T. and Di Paolo, E. A. (2014). Non-representational sensorimotor knowledge. In A.P. del Pobil et al. (Eds. ): From Animals to Animats 13, Proceedings of the 13th International Conference on Simulation of Adaptive Behavior, SAB 2014, LNAI 8575, pp. 21–31, NY, Springer Verlag. 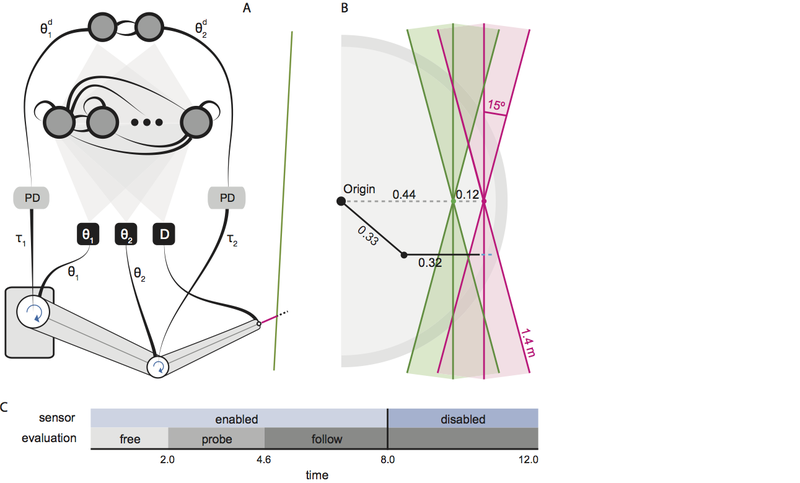 Following our recent work on formalizing some aspects of the sensorimotor approach to perception – in particular the notion of sensorimotor contingencies – using dynamical systems theory, we have continued along similar lines and tackled the question of how we ever learn to perceive something new. The sensorimotor approach proposes that perception is constituted by the possession (and depending on the interpretation, also the enactment) of skilful mastery of sensorimotor regularities, so that in order to perceive something as soft, one must already know how and where one should apply pressure to it. The question that emerges is how do we ever learn to perceive something new if, according to this approach, perception requires already having a sort of sensorimotor mastery. In this way, that which we know how to perceive is perceivable, but that which we don’t know how to perceive could never be perceived because why would we develop new forms of mastery in order to perceive something that we don’t even know it’s there? The problem has a solution once we admit that the notions of mastery and skill can have degrees. At a subpersonal level it is possible then to build a theory that establishes how we progressively form new sensorimotor capabilities as much as a response to internal norms as through the guidance of the world. An example of such a theory is Piaget’s theory of equilibration. 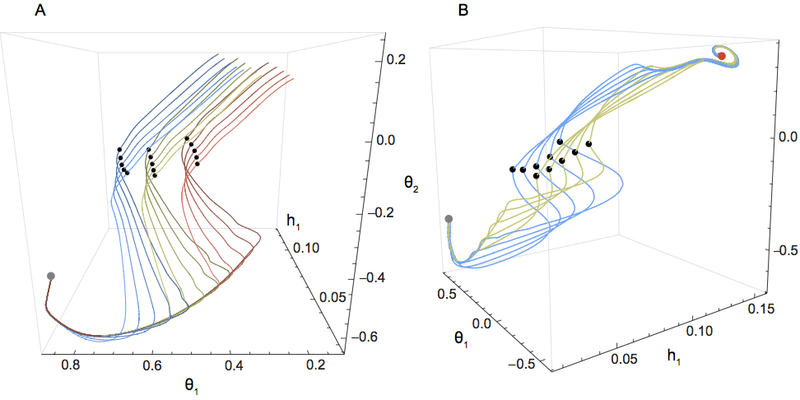 offers a reformulation of Piaget’s theory in the language of dynamical systems theory, which allows us to establish a strict compatibility with our previous formalization of sensorimotor contingencies. We these developments it is now possible to start thinking of more operational notions of mastery, thus contributing to various debates in embodied cognitive science. We see mastery in non-representational terms, as a progression of dynamical relations of equilibration with the world (including the world of others, although this is not directly addressed in this paper).